FILE - Syrians gather at a site of car bomb in the northwestern Syrian city of Idlib, Aug. 2, 2018. Russia on Tuesday joined Iran in expressing support for Syria's impending operation to retake control of rebel-held Idlib province, the last major opposition stronghold in the country. Kremlin spokesman Dmitry Peskov said Idlib is a pocket of terrorism, and that the situation there is undermining efforts to find a political resolution to the Syrian conflict. That follows statements Monday by Iran's Foreign Ministry saying Idlib should be cleared of "terrorists." Iranian media also quoted Foreign Minister Mohammad Javad Zarif saying during a visit to Syria that Idlib should be put back under the control of the Syrian people, and that reconstruction efforts in Syria and the return of refugees should go forward. 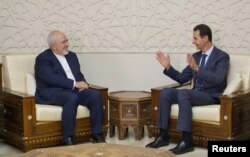 Syrian President Bashar al-Assad meets with Iran's Foreign Minister Mohammad Javad Zarif in Damascus, Syria, Sept. 3, 2018. There are about 3 million people in Idlib and the United Nations has said it is worried about the potential humanitarian toll that may come with a Syrian military campaign there. U.S. President Donald Trump warned Syria in a tweet Monday evening not to "recklessly attack" attack Idlib. He also called on two major backers of President Bashar al-Assad's military to also restrain their actions. 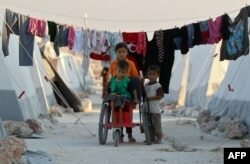 "The Russians and Iranians would be making a grave humanitarian mistake to take part in this potential human tragedy. Hundreds of thousands of people could be killed. Don't let that happen!" Trump said. David Lesch, a history professor at Trinity University in San Antonio, told VOA that while the Trump administration is "ratcheting up the pressure a little bit" beyond its previous admonitions to not use chemical weapons, but that U.S. influence on what happens in Idlb is limited. "Frankly speaking, I don't think there's anything the United States can do about it. I think Russia and the Syrian government and their allies are dead-set on taking over Idlib, either in a phased way or in an all-out massive invasion," Lesch said. Syria has been at war since early 2011 with a multitude of parties including pro-government forces, rebel groups and militants all fighting for control over various areas. Assad's forces, backed by military support from Russia and Iran, have recaptured major cities in recent years, often involving agreements with both opposition fighters and civilians that allowed them to flee to Idlib. Assad's government has long referred to any opposition fighters as "terrorists." The Idlib area includes both rebel groups and militants such as the Nusrah Front. The presidents of Iran, Russia and Turkey are set to hold a meeting in Tehran on Friday to discuss the situation in Idlib.